The U.S. Army’s policies designed to mitigate risk may create a distortion for commanders by weighing tactical risk as less important than accidental and causing suboptimal decisionmaking. There is no such thing as eradicating risk on the battlefield. Act too quickly, and you will make mistakes. Wait too long, and the enemy will punish you mercilessly. We expect commanders to properly balance this tension; we give them staffs, access, proximity to the battle, and authority to make decisions. Yet combat is still a messy business. The Army proves this time and again by making mistakes such as friendly fire and civilian casualties, and causing collateral damage. Things go wrong; this is known as the fog and friction of war. As a responsible profession, the Army has gone to great lengths to develop processes to mitigate these risks. As we apply them over time, the probability of accidents goes down. In practice, this represents actions such as confirming the impact area is free of friendly troops, conducting a collateral damage estimate assessment to decrease the likelihood of civilian casualties, and checking the path of munitions to ensure they don’t shoot down friendly aircraft. Each of these tasks takes time and decreases the risk of shooting at ourselves or noncombatants, or causing other collateral concerns on a crowded battlefield. By applying more time and process, we can continue to squeeze out risk. This seems responsible; there is no reason to risk damage to equipment or people’s lives when it’s avoidable. But time matters in combat; this is one goal of training. By rehearsing people and processes for a given amount of time, we can decrease the level of accidental risk incurred. Simply put, we can execute our procedures faster, without degradation of quality. By taking our time and training hard, we can squeeze out of a task nearly all of the risk. Accidental risk, however, has an evil twin called tactical risk. Tactical risk can be defined as the risk to friendly troops as time passes from the moment of detection to the execution of a decision by the commander. Picture a platoon of light infantry in Iraq. They identify enemy in a building and the longer they wait to take action, the more tactical risk they incur. The enemy may be preparing an attack, calling for reinforcements, or planting IEDs behind them. The idea is that as time passes, the risk to the decisionmaker’s troops increases. By conceptualizing these two phenomena occurring simultaneously, we can start to visualize the overall risk. What we want to find and give to commanders is the point at which the overall risk is minimized. At this point, even though we can continue to decrease accidental risk by taking more time and applying more process, the mitigation of risk occurs at a lower rate than the increase in tactical risk, meaning the overall risk is increased. Conversely, if we act too quickly and make a decision before this optimal point, the accidental risk is still dropping rapidly. This means that by delaying a little longer in what’s often called “tactical patience,” we can decrease overall risk. We’ll call this optimal point, the point where the lines cross, the total risk crossover—the point at which the reasons to execute exceed the reasons not to execute. 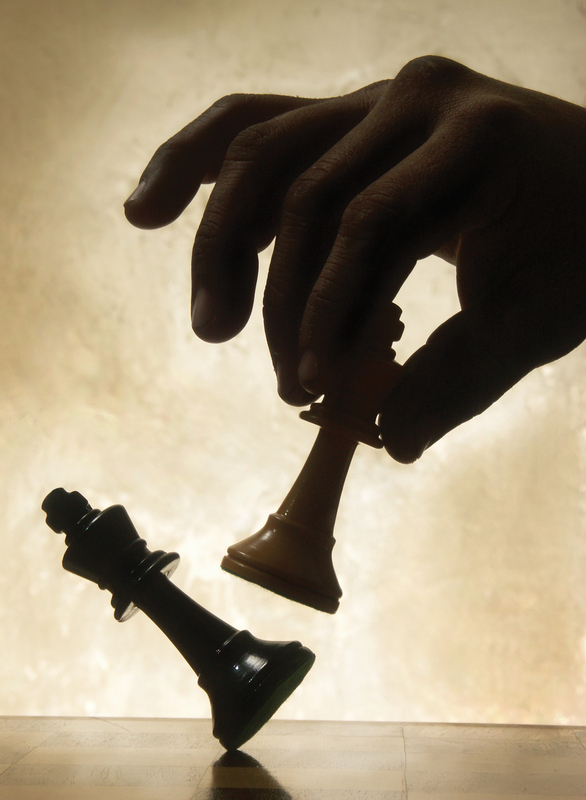 Where suboptimal decisions can occur is when the nature of the tactical risk changes. Take a situation where small amounts of time incur large tactical risks. No longer in Iraq where the enemy rarely formed a complete squad, envision a company of enemy tanks that the friendly infantry platoon encounters. This time, the tactical risk of inaction increases much more rapidly. Instead of a slow and relatively low-grade response by the insurgent force, this new enemy uses the time to maneuver on the platoon, destroys the formation, exploits the advantage, and continues wreaking havoc on the units behind. What we see as the tactical risk profile becomes more sensitive to time is that a new optimal decision point emerges, one that encourages more rapid decisionmaking and execution. This can be quite a shift in mentality. After so many years of prioritizing collateral concerns, we have become fixated on procedures to mitigate accidental risk. It may be an individual approval authority, or a process designed to bring us down the accidental risk curve, but both take time and may force us to blow right past our new optimal total risk crossover point. My claim here is that the idea of “mitigating” risk in this scenario is not possible. The idea that we can reduce risk in the moment ignores that any time deviating from total risk crossover assumes additional overall risk. All we can do is manage it beforehand with training, and optimize within the constraints in execution. Therefore, we aren’t mitigating it; we are transferring it between accidental and tactical, and should be searching for the optimal point to execute. This decision is made difficult or impossible due to the rules in place, and the authority required to break these rules. It may be time to take another look at who can turn on and off the accidental risk mitigation measures. Take a closer look at the decisionmakers. Unconstrained, we can envision commanders reading the above analysis, having their operations research/systems analysts collect the data, derive the risk curves, and spit out a matrix for making optimal decisions. In practice, what we observed was that commanders are subject to policies; doctrine; and tactics, techniques and procedures from 15 years of counterinsurgency that either discourage or forbid them from taking such liberties. So who bears the tactical and accidental risks, and does the resulting incentive structure facilitate optimal decisionmaking? There are two types of accidental risk: collateral damage and fratricide. Both of these outcomes are extremely undesirable, and rightly so. The U.S. Army is not in the business of killing itself or noncombatants. When either of these events occur, commanders are immediately involved in the ensuing investigation. Procedures are analyzed for compliance, and new measures are designed to prevent another such incident. We have come to expect additional “control measures” to prevent repeat offenses. It appears as though the commander and staff fully internalize the penalty of assuming excessive accidental risk. This makes rational sense, since making the same mistake twice is often an unforgivable sin. What is clear, though, is that specific individuals, especially commanders, are held accountable. On the other hand, tactical risk does not appear to be so cleanly internalized. Maybe because we as a military haven’t encountered steep tactical risk profiles in recent memory (as will occur given a near-peer adversary), we have lost the decisiveness that comes from that type of mentality. Another possible cause is that in general, it is harder to exactly identify the root cause of negative tactical outcomes. Inefficient adherence to standard procedure is not a common finding when examining why we lost a battle; usually the historian identifies this as the issue. Commanders at each level are left with asymmetric internalization of tactical versus accidental risk; they are individually incentivized to favor tactical risk over accidental. By recognizing this distortion, we can empower our decisionmakers with the tools and support they need to make the right calls in the field, underwrite good decisions that happen to have bad outcomes, and buy back some accidental risks we have delegated to the lowest levels. The idea is to set the framework for a discussion that can realistically result in deregulation of commanders’ decisions and processes. Success would look like a brigade commander requesting a daily or weekly—rather than shot-by-shot—collateral damage estimate approval, citing excessive assumption of tactical risk as the reason. It could also look like a battalion commander asking for respite from training requirements when they are crowding out more efficient allocations of time. We can afford for pundits to judge sports teams on outcomes instead of decisions, but if readiness and leader development are to be the Army’s priorities, we will need to support decisionmakers with the constitution to defend their decisions on the decisions’ overall merit rather than just on whether or not they were successful. Leadership is oftentimes defending the unpopular. Maj. (P) Samuel Linn is a professor of military science at Fordham University, N.Y., and has served as an assistant professor of economics at the U.S. Military Academy. He has deployed with the 101st Airborne Division; 75th Ranger Regiment; 5th Stryker Brigade, 2nd Infantry Division; and most recently with 4th Infantry Brigade Combat Team, 4th Infantry Division, Fort Carson, Colo. He holds a bachelor’s degree from West Point, and an MBA from the Wharton School of Business at the University of Pennsylvania.